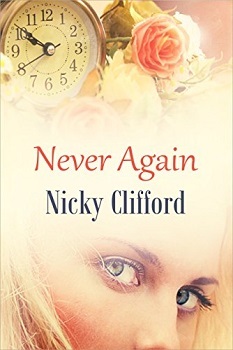 Today I have the honour of interviewing author Nicky Clifford about her writing life, and about her latest book, Never Again which was released on the 21st October 2016. So without further ado, say hello to Nicky. I don’t remember the actual moment; it feels as if I was born with this innate passion burning within me to write. From an early age, I wrote poems and short stories, although novel writing took a bit longer to sprout wings. My first published poem was written for Blue Jeans Magazine too many years ago than I care to remember! In my thirties, I visited the London Poetry Library and as a result, 40 of my poems were published in a variety of poetry magazines. Several of my articles have also been published. From time to time, I have dipped my toe into various writing courses, although it was the ‘Write a Novel’ course I attended a few years ago that kick-started my journey to publishing my debut novel. Being part of the writing group that sprung from the course has also been instrumental in encouraging me to keep on writing. 3) Which authors inspire you? In lots of ways, all authors inspire me. I had no idea until I started this process just how much dedication and commitment you have to have to transform your written words into a finished novel. Jodi Picoult is definitely one of my favourite authors. She manages to tackle controversial subjects by weaving a story around characters that you not only believe in, but care about. I love the way she writes in the first person, changing the voice of the characters with every new chapter. 4) What is your working day like? Do you aim for a certain amount of pages/words per day? I must admit I don’t set myself a page or word count because my life is so fluid and my days vary from week to week. Fortunately my passion for writing means that if I had my way, I would be writing all the time. My problem is trying to squeeze the rest of my life, including a part-time job, in between the many words I manage to produce. Saying that, there are times when my creativity is not flowing and it is easy then to get distracted. I have to make myself stay in front of the laptop and keep writing, even if it does feel a bit like forcing a square peg through a round hole. Having contracted Chronic Fatigue five or so years ago, I also have to pace my day with rest periods otherwise I put myself in danger of burning out. 5) Do you have any strange habits or rituals whilst writing? I do like a clean and tidy room and desk. I just can’t cope with clutter – it seems to infiltrate my brain and clog up the thought processes! I do like to have a constant flow of decaf tea, so I am up and downstairs from my office in the corner of our spare room to the kitchen. I have to keep referring back to my character biogs and timelines, however I am going to start using the writing tool, Scrivener, which will apparently make my life much easier as it stores all this information in the same place rather than opening different Word and Excel documents. 6) Do you write Longhand, Typewriter, Computer? I prefer to type straight onto my laptop, although there are times, mostly when I am on holiday, that I write in pen on a pad. The frustration with this is that I then have to type up what I have written, which always seems a duplication of effort. However, the glare from the sun and the combination of grainy sand and salty sea is not always conducive to the use of electrical equipment! 7) Do you have a favourite character(s) in any of your books? It is really hard to identify a favourite as I almost feel disloyal singling one or two out. I become so close to them all during the course of a novel, however, there are some that I would definitely not wish to be friends with (ie Becky from Never Again!). However, if I was pushed, I would say that Elspeth in Never Again is very loyal and caring, and yet has a wicked sense of humour and a wisdom befitting her years. She would make a great friend and confidante. 8) Do you plot your books completely beforehand, or do you let your imagination flow whilst in the writing process? I only wish I could! I have always wanted to plan the whole book in advance as I am a very organised, list-making type person. And yet, when I sit down and try to sketch out the plot, my mind goes blanker and blanker. So instead, I spend a long time creating my characters and building backgrounds for them. I then take them to a location and see what happens. Although this sounds a bit crazy as I am allegedly the writer, it often amazes me what happens next! The characters definitely write a large proportion of the story for me. Harriet Anderson’s life is spiralling out of control. Unused to such mayhem, she ditches her high-powered job to take refuge in the Swiss Alps where she meets Philippe Smith, a crime writer with a dark and shadowy past. 9) How long did it take to get from the ideas stage, to the date of publication? It is difficult to say exactly as Never Again started its life as Room Service; it was one of the novels I abandoned, half finished, several years ago. I would say that, all in all, the process took around two years. 10) Did you suffer from writer’s block at any stage? How did you overcome it? Oh yes, I certainly did. There were regularly times when I stared into space not quite knowing where the story was going or what to write next. I have learned during these times to do a bit of brain-storming. I try to think of something exciting or interesting one of the characters could do or places they could go. Sometimes I stick one of the characters into a completely different setting and write a sketch about this scene; I won’t necessarily use this extract in my novel, but it gets my writing flowing again and gives me more insight into this particular character. At the writing group I attend, we frequently give each other a place, an object and an emotion and we have to write a 300-word flash fiction piece around these words. Again, this tool has helped me through my sparser creative moments. 11) How did you come up with the name(s)for your lead character(s)? I can’t exactly remember how I chose ‘Philippe’ and ‘Harriet’, but I tend to follow the same routine. Once I have developed my characters, I browse the internet to find a photo of someone who matches their description. I find it easier to hold the vision of my characters in my mind if I have an actual image of them to focus on. Then I play around with different names and see if it suits the characters I have created. I was told not to call my main characters’ names that began with the same letter as it can confuse the reader, so I try to stick to this. Sometimes I look up lists of names on Google and trawl through these to see if any particular name jumps out at me. 12) Can you give us an insight into your main character (s), What makes them tick? Harriet has been dealt one too many blows in her relatively short life. She always strives to prove herself as her mum was as much of a good role model as her dad was a poor one. Travelling to Switzerland was her way of trying to heal from and make sense of the trauma she has experienced during the previous six months. Whilst she is wary about falling in love again, she can’t help but be powerfully drawn to Philippe. However, when her past catches up with her, she is torn with indecision and it seems that whichever way she turns, she will be left with a broken heart. Philippe is also escaping from his life which has changed unrecognisable over the past year. Even though the last thing he wants is to dive into another relationship, Harriet manages to wriggle under his skin far too quickly for his liking. Even though he tries to immerse himself in his second crime novel, Harriet is constantly thrown into his path. Shadows he thought he had left behind him for good, catch up and throw his life into chaos. He can’t believe this is happening and has no idea how to resolve the situation which is quickly spiralling out of his control. 13)If your book was made into a film, who would you love to play the lead character(s)? I love this question – it would have to be a young version of Cameron Diaz playing Harriet, so maybe Jennifer Lawrence! As for Philippe, Zac Efron or Chase Crawford would fit the bill nicely, although they would have to make sure their hair was blond! I would, of course, have to interview them personally for this role! 14) Did you get anyone in particular to read your work before sending it to the publisher i.e family member, friend etc? I have been so lucky, a lot of people have given up their time and read through my novel to help improve it: three of my close friends, my eldest son, Sam and his girlfriend, Beth, and members of my writing group all read my novel during the many drafts I churned out. I really appreciated their honest feedback; without their help Never Again would not be so polished. Chrissie from my writing group edited a large proportion of my novel, Emma from EmmabBooks passed on a few suggestions when she read an early Advanced Reader Copy during her review. As I am self-publishing, my husband very kindly proof read Never Again. It has truly been a team effort.